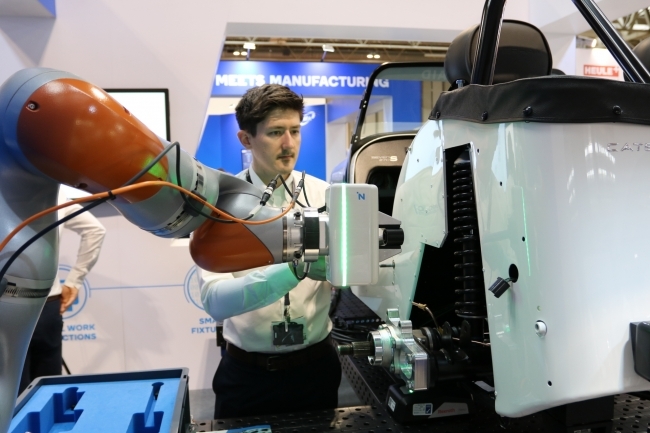 Engineers at the University of Sheffield Advanced Manufacturing Research Centre (AMRC) are leading the way in Collaborative Robotics research in a drive to help SMEs integrate the technology onto factory floors. Collaborative robots – also known as cobots – differ from conventional industrial robots in that they feature technology that allows them to operate safely alongside human workers in a shared area. They are capable of operating with limited force and speed and are equipped with force-sensing to enable them to stop when they come into contact with an operator. Phil Kitchen has been leading on a Catapult-funded Collaborative Robotics research project for the Integrated Manufacturing Group at the AMRC’s Factory 2050, developing technology demonstrators for industrial partners to show how humans and robots can work safely together and testing a new safety standard awaiting ratification for different types of cobots. 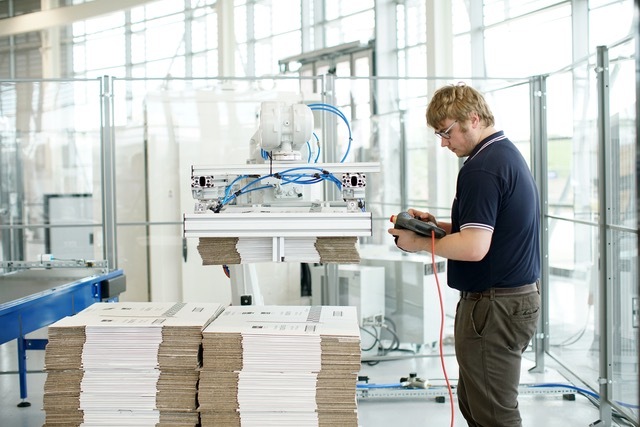 The project began in May last year and completed in March this year with the aim of developing a gold standard in cobot safety that could increase confidence among SMEs to integrate the technology onto their factory floors and transform production lines by increasing the rate at which a process is done, as well as the uniformity and quality of finish on a product. As part of this work a cell was created at Factory 2050 which demonstrated cobot safety integration to show potential adopters the usefulness of the technology and that it is able to be industrialised. Phil said: “What we want to do is to start to develop a gold standard for integration. “To get this gold standard, for us, it would mean we could help SMEs to integrate cobots on to their shop floor. “There are a number of benefits of collaborative robotics for SMEs – improved quality, improved rate, so the rate at which they are making their products – and if they improve rate they can potentially sell more and expand, helping them to grow through the use of collaborative robotics. “A technical specification was released which detailed how you would go about integrating a collaborative robotic system. It’s not yet been ratified as a full ISO standard to use and that is being worked towards now. 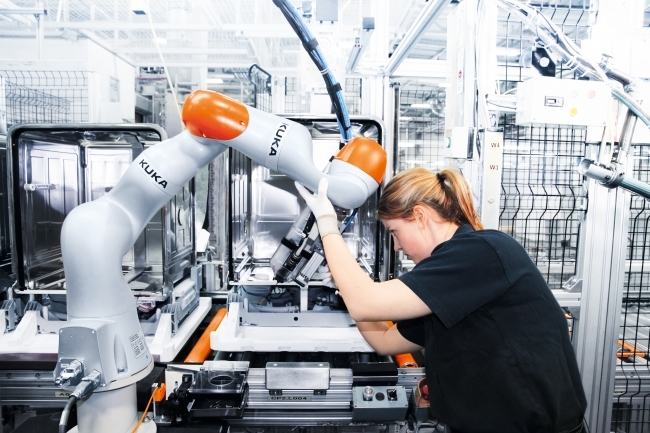 Cobots are suited to any industry that involves assembly – ranging from aerospace and automotive to pick and place and inspection. Phil said one of the challenges for companies wanting to use the technology is the task of safely integrating these robots – there are limited companies in the UK who have the knowledge do this. By doing the research now, Phil said it will position the AMRC at the forefront of collaborative robotics expertise in the UK. He said: “The KUKA iiwa robot is the one we have the most experience with and it’s quite different from other standard KUKA robots and robots in general, in that it’s programmed in Java. Typically, robots are controlled using the brand’s proprietary programming code which tends to be quite linear and easy to understand whereas Java is more flexible but because of that it’s more complex. “It’s a challenge for companies that want to integrate them because they have to have someone that can program in Java, which relatively small manufacturing companies typically don’t have. And this is why we are now delivering projects with a range of cobots to give our partners the correct solution for them. He said: “Cobots can be used as a flexible resource and they differ from standard industrial robots as they have some element of safety built in. So for example, with the KUKA iiwa – that has force and torque sensors in each of its joints so if it touches you it can sense an external force being imparted on to it and will stop itself. Collaborative robots work alongside humans and use of the technology is about increasing productivity and uniformity of the parts they produce. “A good example of that is a project we did for a Tier 1 AMRC member,” said Phil. “They had a process where they have fastening components and apply adhesive to them. “To apply the adhesive, operators have to use manual adhesive guns that have to be pumped and it is really tough on their hands. They are doing thousands of these per week so the operators have a risk of repetitive strain injury. “As well as relieving operators’ hands, the project looked for ways to increase rate – the picking of a tool, gluing and replacing takes a fair proportion of the process, so if you can apply glue while the operator inserts the fastener you’ll be able to save time over hundreds of cycles. Phil said the main driver for companies getting involved with cobots research now is to ensure they are not left behind when the technology becomes common place on factory floors of the future. He also believes it has the capacity to significantly ramp up manufacturing production in the UK, leading to the creation of more jobs, including roles for skilled workers needed to maintain collaborative robots.